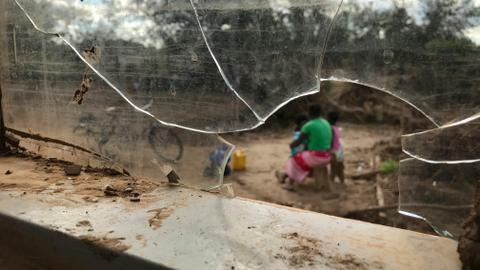 Even as flood waters began to recede in parts of Mozambique on Friday, fears rose that the death toll could soar as bodies are revealed. The number of deaths could be beyond the 1,000 predicted by the country's president earlier this week, said Elhadj As Sy, the secretary-general of the International Federation of Red Cross and Red Crescent Societies. TRT World's Nick Harper reports from Zimbabwe-Mozambique border. Thousands of people were making a grim voyage toward the city of Beira, which although 90 percent destroyed has become a centre for frantic rescue efforts throughout the region. Helicopters set off into the rain for another day of efforts to find people clinging to roof tops and trees. For those who reach Beira with their few remaining possessions, life is grim. Waterborne diseases are a growing concern as water and sanitation systems were largely destroyed. "Yesterday [we] did a reconnaissance and we found another [inland] lake. So we are still very early in the phase of identifying what the scope of this is, for who is affected and how many are lost," Emma Batey, coordinator for the consortium of Oxfam, CARE and Save the Children, told the AP. For residents of Beira, life staggered on. People salvaged the metal strips of roofs that had been peeled away like the skin of a fruit. Downed trees littered the streets. And yet there were flashes of life as it used to be. White wedding dresses stood pristine behind a shop window that hadn't shattered. In Mutare, fear gripped residents even though they are more than 140 kilometres (85 miles) from Chimanimani, the worst-hit part of Zimbabwe. "There are no jobs and all he wanted was to feed his family. He was with his colleagues. They thought it would be easier to mine since the rains would keep the guards and the police away from patrolling," Chisiriirwa said. His colleagues survived but her son-in-law was swept away, she said. A man who traveled several kilometres to a reception centre for survivors in Chimanimani said several of his colleagues were swept away as they tried to cross a river while fleeing from a mountain known for rich gold deposits and frequented by hordes of illegal miners.